Add a touch of refinement to your dinner party, reception, and cocktail parties with our sophisticated yet practical disposable plastic buffet and pastry displays. Whether you are serving appetizers, cupcakes, pastries, or macarons, our line of buffet and pastry displays will add an astonishing finishing touch and will wow your guests. Our disposable pastry displays are also perfect for bakeries, take-out restaurants, chocolatiers, and catering businesses. 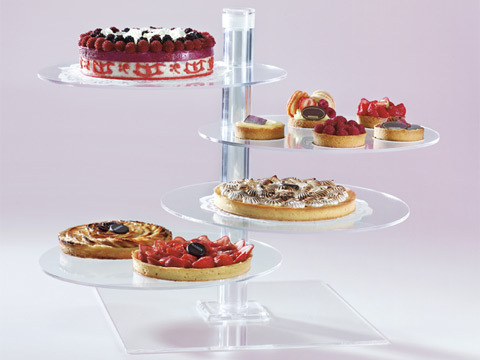 Get your disposable plastic buffet and pastry displays at an affordable price with our wholesale prices. If you have questions about our buffet and pastry displays, or if your need more information about our services and prices, we invite you to contact us. Buy your catering supplies online and get free shipping everywhere in the United States with every $500 orders.